Portugal – Please Switch The Lights Off When You Leave! 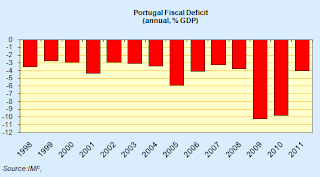 The recent decision by the Portuguese constitutional court to unwind public sector salary cuts included by the government in its austerity measures has once more given rise to speculation the country may not meet it’s 4.5% deficit target for 2012. The court – which ruled the non-payment of the two traditional Christmas and Summer salary payments for the years through 2014 was unconstitutional took the view that since the measure did not also apply to the private sector, it was discriminatory. Whatever view we may take on how the Portuguese Constitution defines “discrimination” the important detail to note is that the decision will not apply to 2012, and will hence only have the impact of forcing the government to find additional adjustments for 2013 and 2014, or at least a new formulation which allows them to constitutionally cut public sector pay. Nonetheless, despite the fact it will not affect this years fiscal effort the coincidence of the timing of the court decision with the appearance of a report from the parliamentary commission responsible for monitoring the execution of this years budget only served to heighten nervousness about the possibility that, with unemployment rising more sharply than anticipated and the economic recession still accelerating, this year’s deficit numbers may not add up as planned. 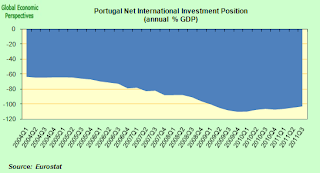 Otherwise Portugal may find itself in the invidious position of complying with most of its immediate programme objectives while leaving the road to sustainable debt and growth levels may fraught – as the IMF itself notes in its April programme review – with almost insurmountable difficulty, thus putting the long term future of the country in doubt. This post – which is a revised and expanded is version of a presentation I recently gave in Brussels – will examine the challenges – both demographic and economic – the country faces in the longer term. You can find the original presentation on Slide Share. So now we know that the issue is not hard to define, the only difficulty facing policy makers is finding the way to do something about it. Under standard economic theory, once a country falls into recession the “hidden hand” adjustment mechanisms will, one day sooner or one day later, serve to drag the country back out of it again (unless, naturally, the economy is caught in one of those darned liquidity traps). But for the countries inside the Euro the normal automatic adjustment mechanisms aren’t operative, since one of the links in the chain – the devaluation one – has been (intentionally) broken. So as we can see, countries can get “stuck”, and aspects of the situation can become “self perpetuating” – and this is the danger that Portugal faces. 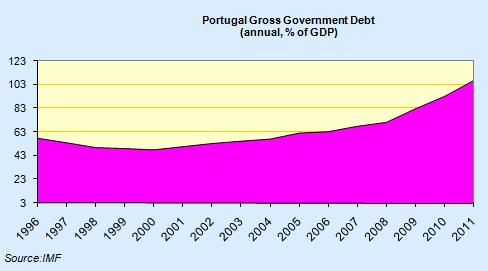 Portugal’s problem is as much about debt as it is about growth. During the Euro years the levels of both the public and the private sector debt grew substantially – which means it has the worst of all worlds. And it isn’t just any old debt. A lot of it has been financed through the European interbank market, meaning a massive external debt has been run up, and used to finance all those imports and current account deficits. Portugal’s net international investment position showed a debt of over 100% of GDP at the end of 2011. 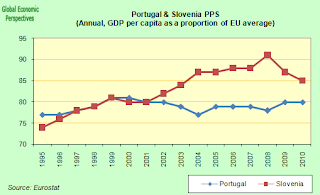 So, far from Euro membership being an unmitigated success for Portugal, the country has seen a serious lack of growth in living standards and even a loss of relative position in the “Euro league” If we look at the graph below – which shows per capita GDP in both Portugal and Slovenia as a percentage of the EU average – we can see that while living standards in Slovenia rose steadily during the first decade of this century, in Portugal they were more or less stationary (in relative terms). Yet as we know, Portugal is a comparatively poor country in EU terms, and should have benefited much, much more. 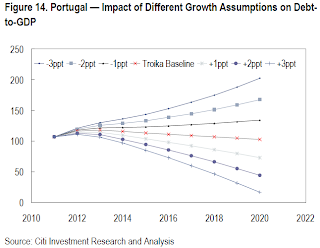 Now Portugal’s relative position is even likely to fall. The thing I often say about the monetary union is that it is a structure which offered every facility to a country which wants to get into trouble (cheap borrowing, enhanced credit rating, very low sovereign debt spreads) but which makes it much more difficult to correct the problems once they have built up. Portugal’s tragedy is that it got into trouble just before it joined, and the Euro only added to the countries problems rather than offering a framework which made it possible to sort them out. How ironic that the one country unable to advance unaided the reform and growth programme that became know as the Lisbon Agenda should be Portugal. The real “Lisbon” agenda was evidently something else entirely. In what was to be a harbinger of events elsewhere a decade or so later, the country systematically lost population during the EU “coupling” years, as workers left in droves in search of higher wages elsewhere. The phenomenon has left a lasting scar on both the economy and the society. Little surprise that the country which was once a prototypical “emigration society” should so rapidly have become one again under the impact of the current crisis. 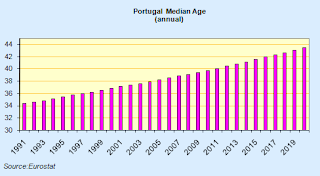 Naturally Portugal, like all European societies, is ageing quite rapidly, a process which won’t be helped any by the significant numbers of young people who are now leaving. And the main reason for this societal ageing process is, of course, long term very low fertility. I’ve said it before, and I’ll say it again, it makes absolutely no economic sense for a society with long term fertility well below replacement rate to become a net exporter of labour. In the long run the economy of such a country cannot be sustainable, and I’m surprised the IMF haven’t noticed this yet. And as a result the Troika has consistently given Portugal what can only be called “glowing reports” – which compared to the ones Greece receives they certainly are. And along with the deficit even the bond yields are coming down. Yields hit a spike back in February as markets worried about the second Greek bailout, with its debt restructuring component, and asked themselves the question – will Portugal be next? Well, so much for the good news. Despite the high level of programme performance, the country still faces severe “challenges” since implementing reforms and austerity is one thing and achieving growth and reducing debt quite another. Not unsurprisingly, the economy is now in deep recession. The IMF expect the economy to contract by 3.3% in 2012, and return to timid growth in 2013 (0.3%). But as the fund themselves recognise, there are strong downside risks to the 2013 forecast, and it is not improbable the economy will once more contract. Equally worryingly, unemployment has now started rising sharply, raising questions about a “Greek turn” in events. Apart from the social distress caused this surge in unemployment is having two consequences. The original deficit targets will not now be met, even with this years public sector pay cut, and the young and educated are leaving the national ship in increasing numbers. As the IMF says in its April programme review the country is conducting a large macro economic adjustment with only a “constrained toolbox” available (a euphemism I presume for the inability to devalue). The IMF report was, incidentally, quite frank and realistic about the problems the country faces, unusually so, and far more explicit about the issues than the Romania one I reviewed last week. program’s objective of rapidly reducing macroeconomic imbalances remains out of reach in the near term”. And while the current account deficit has been substantially reduced, the IMF are still forecasting a 4% of GDP one for 2012. More tellingly, they see the country as being unable to reduce the deficit below 3% of GDP before 2018. To really start to get sustainable export-driven growth and ongoing debt reduction (what the IMF call “external stability”) we will need to see, remember, the current account move into surplus, and stay there. So are we facing a case of the low hanging fruit now having been picked? 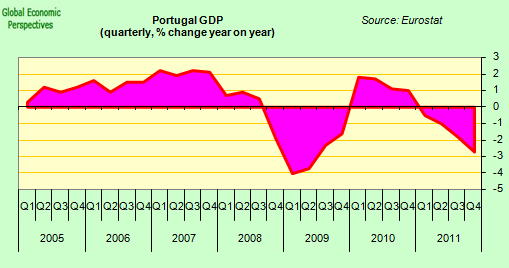 In any event, and taking the IMF warnings to heart, it doesn’t seem unrealistic to suppose that Portugal will need some sort of support for its correction throughout the rest of this decade. That is what having a “constrained toolbox” means. Portugal’s post 2009 export recovery has been strong. Obviously Portuguese exports will pick up again once global growth starts to recover, but by just how much can they pick-up without a much larger change in relative prices? As part of its third programme review the IMF carried out a competitiveness study as a result of which the Fund estimated the competitiveness gap at some “13–14 percent as of 2010”, noting in passing that “the gap has to date only narrowed marginally (by about 1 percentage points)”. 13 percent would be needed”. Both ways of looking at the issue seem to give a similar result – that around a 13% improvement in competitiveness is needed – and given that they also found that “since peaking in 2009, the adjustment in unit labor costs has been fairly limited. In particular, as of Q3 2011, ULC-based real effective exchange rates are only 2–3 percent below their 2009 peaks” it is clear there is still a very, very long way to go. 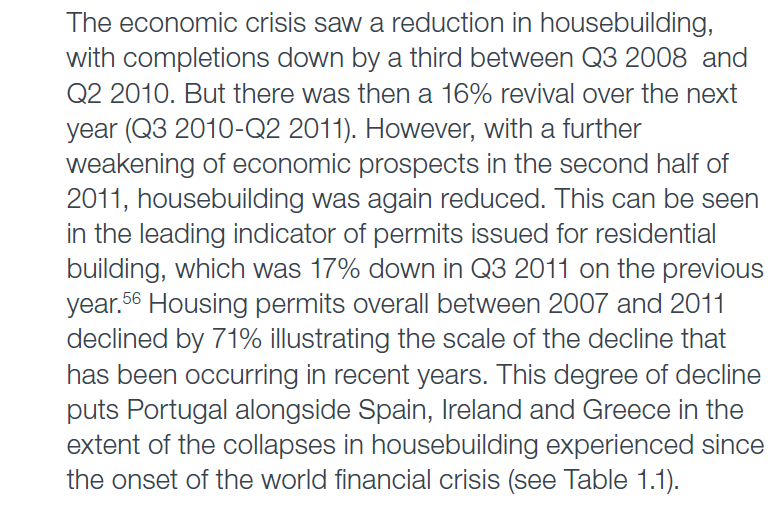 Also bad loans are rising, and especially in the construction sector. Bad debt owed by Portuguese households and companies rose a further eight percent in April to reach almost €14 billion according to bank of Portugal data. This was an increase of €2 billion since the start of the year. 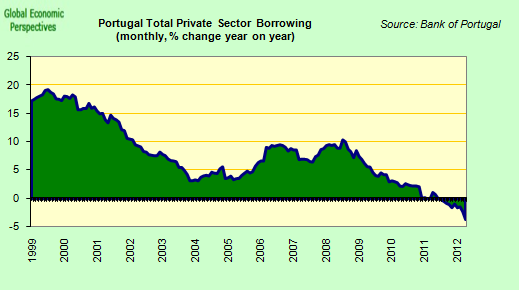 The majority of this, around €9 billion, is corporate debt, but there has surely been a good deal of “evergreening” going on, and the total exposure of Portuguese banks to souring loans – in particular builder and developer ones – is undoubtedly much larger. 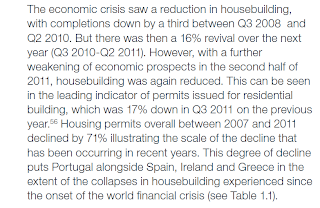 Portugal did not have a housing boom like Spain or Ireland, nonetheless with a strong tourist industry construction has played an important role in the economy in recent years, constitution something like 18% of total GDP in turnover terms. According to Manuel Reis Campos, head of the Portuguese Construction and Real Estate Confederation, the sector, which is the country’s largest employer, faces rampant unemployment and bankruptcies that threaten the repayment of 38 billion euros in debt to the banking sector as the credit crunch and austerity bite. “The (construction) sector owes 38 billion euros to the banks, bad loans have gone up sharply, much more than expected, along with bankruptcies. We expect 13,000 companies to go bust this year and the sector to lose 140,000 jobs,” Reis told foreign correspondents at a briefing. “The sector has no work, the banks don’t finance us and the state does not pay. It is a disaster,” Reis said. Reis predicts the country will follow Greece and Spain into the 20% plus unemployment bracket by the end of this year if things don’t change – government forecasts have unemployment rising to 15.5% this year from last year’s 14% and to 16% in 2013. Unemployment was at a seasonally adjusted 15.2% in May according to the latest Eurostat data. Construction and real estate employed 670,000 workers in Portugal in 2011, compared with 830,000 in 2008. Conclusions – What Happens Next? Portugal is scheduled to return to the bond markets next year. Given the outlook for the sovereign debt crisis this seems unlikely to be possible. In addition January’s Standard and Poor’s decision to downgrade the country (from BBB- to BB), means that its debt is now rated sub-investment grade (aka “junk” status) by all three main credit rating agencies. In practical terms downgrade led to a reduction in the country’s potential investor base, since many investment and money market funds are now unable to hold Portuguese debt, while resident financial institutions can’t possibly assume responsibility alone. On the other hand markets have pulled back from their aggresive stance of earlier this year, and bond yields have fallen substantially. One conclusion which could reasonably be drawn here is that they are now not pricing in Private Sector Involvement (PSI) in any kind of debt restructuring in any forthcoming programme revision during the foreseeable future. And this seems perfectly realistic since Portuguese PSI is most unlikely at this point. What is more probable is a restructuring of the size and term (and possibly interest cost) of the current official sector loans, together with some relaxation in deficit targets in tune with the EU’s new “modified austerity” stance. As the IMF says in its third programme review, “if growth disappoints, interest rates are higher, or the fiscal effort less than envisaged under the program, the debt dynamics would be less forgiving—leading to a debt-GDP ratio that would remain well above 100 percent for the foreseeable future. And the adverse combination of low growth, higher interest rate and a lower primary balance would place debt on an unsustainable trajectory”. They also stress the danger that private sector debt may need – Spanish style – to be bailed out: “The scenarios also show that there would be little scope to accommodate the migration of private sector liabilities to the public sector balance sheet”. Think of Mr Campos mentioned above, of Portuguese builders and developers, and of what may be happening to bank balance sheets even as I write. According to Peter Wise, writing in the Financial Times, “Portugal’s prime minister has been free with his advice to the legions of young and unemployed in his country. They should “show more effort” and “leave their comfort zone” by looking for work abroad. 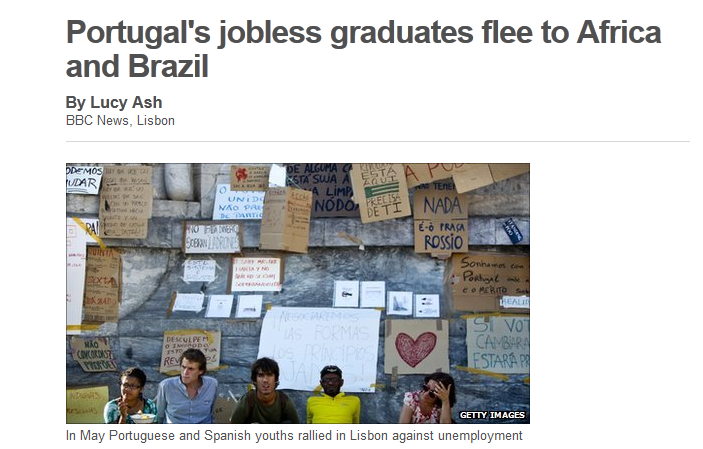 Teachers unable to find a job at home should think about emigrating to Angola or Brazil”. The background to this controversy is, as Peter points out, the sudden emergence of Portugal as an origin country for emigration. The net loss of human capital is evident. The impact on population ageing is less so, but soon becomes clear when you think about what happens to the population pyramid. But what about economic growth, what does this do to the long term growth rate? Isn’t a country with long term below replacement fertility effectively commiting suicide if it exports its working age population? Economic growth attracts migrants as the labour market expands, this increases the working age population and with it the long term growth rate. On the other hand, a country which has a lasting economic contraction can loose population as unemployment rises (this is what is happening now along Europe’s periphery), with the loss of population the potential growth rate falls, and with it future employment. If you aren’t careful this encourages more people to leave, and the situation becomes circular (arguably this has already happened in Latvia) with low growth/recession feeding on itself. If the median age of the people leaving is lower than the median age of the workforce, or if the educational level of those leaving is above the average of the workforce, then the quality of your labour force, and with it potential productivity, falls. At the same time the debt problem becomes greater, since there are less people left to share the debt. Naturally, if the Euro Area was one single nation state like the United States is none of this would be a problem – but it isn’t! Another fascinating (and gloomy) analysis. Any thoughts on WHY virtually all economic analysis ignores the migration and demographic problems? But as the demographic problem is an essentially Europe-wide issue (2009 = 1.59) and mutualizing it will not make it go away. You seem to have chosen the most negative lone forecast, probably because it better fits your own. The latest, following a contraction in the first quarter 10 smaller than expected (0,1% instead of the expected 1%) is 3%, according to the usually conservative estimates of the Bank of Portugal. Basically I don’t think it fits in the neo-classical growth mindset. One day someone will wake up to this, and then IMF reports will be full of material on how to balance fertility. The World Bank did one report on Eastern Europe (From Red To Grey) and then quickly forgot about the issue. The official policy mindset is a long way from the investor one in this sense, since there are a lot of bank reports on demography and its impact (the Goldman Sachs BRICs idea being just an early example of these), and the number of phone enquiries and speaking engagements I get these days is about 50-50 split on Spain’s woes and global demography and its implications. Sometimes I think a formal economics education is like an exercise in learning not to see. Everything is mediated through the lens of a model, and things lying outside the model – which are often obvious to the “untrained” observer – simply get missed. This happens a lot in science, I think. “But as the demographic problem is an essentially Europe-wide issue (2009 = 1.59) and mutualizing it will not make it go away”. What matters, naturally and as we have seen in Spain, is that the growth be sustainable and not an artificial bubble. “You seem to have chosen the most negative lone forecast, probably because it better fits your own”. Similar to the Citi one, and more or less the same as the IMF spring 2012 one. The IMF do not agree with the Bank of Portugal expectation that the goods trade deficit will disappear this year, in part because the external environment is deteriorating, from China to the US. Basically, I wouldn’t pay that much attention to what the national central banks say. As Mario Draghi put it, they have a tendency to be over optimistic for reasons of national pride, which can be dangerous when it comes to loan evaluation as we are seeing in Spain. This is one of the reasons they are being all but done away with to create a new all Europe banking union. Which is more in the Portuguese national interest, to identify the problems and deal with them, or to pretend they don’t exist? It has long been the policy of the euro-anglican left, cheered on the by the Ehrlichians and environmentalists in their midst, that population increase is a bad thing. So why should we expect conventional wisdom to find anything wrong with the picture in Portugal or numerous other nations (about 100) that have a similar problem? When you fear a population explosion you might not want to acknowledge a population implosion or it’s implications. Just another example of the poverty of thought and policy of the western nomenklatura. Portugal has so many problems that you don’t need make up more, or choose just the most negative statistics, that better suit your analyzes. Just two examples in the trade balance (there are more in the rest of the text). It’s not true. You can see in the official trade statistics (it’s INE that calculates that and Eurostat that validates) that this year there was never a negative month. April has been the worse with a 2,9% rise on exports, in May it recovered to 8.4%. In April there has been a small negative number in the exports to the EU (-0.8%), i don’t know if that’s what the WTO is showing on the graph you posted here. Even so, that negative number has been well compensated with the rise of the exports to the rest of the world, that have been constantly rising at around 30%. One fact that you don’t seem to care. Just like any other positive point that’s happening in the country. Also loved your graph about the Goods Trade Balanced. If you have one graphic that shows that Portugal will have a surplus in 2012 in the Total Trade Balance (Goods and Services), and one that shows a deficit in the Goods Trade Balance, you obviously choose to show the one that has a deficit. Who cares about services right? 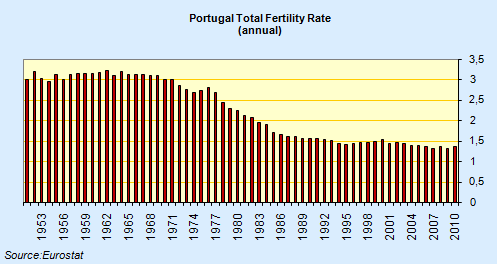 I suppose the demographic side would be one reason why perhaps Ireland’s situation is better off than Portugal etc. 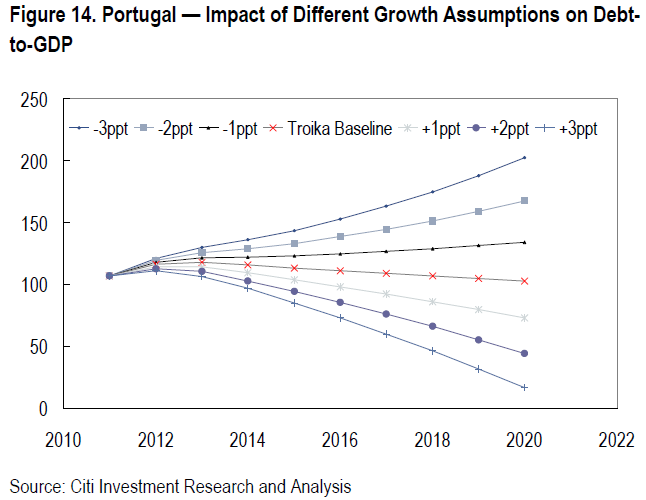 The bank of Portugal has a tradition of being very pessimistic. All in all a not so serious and very superficial analysis of the Portuguese situation. Both the timing and the contents of this analysis are strange. Why the use of outdated data, and worse, why talk about Portugal now, when everyone else is a bloody shipwreck? 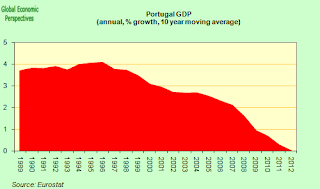 To who mentioned ireland, yeah with a negative growth of -1.1% in the first quarter they’re definitely better off than the Portuguese… Portugal is a small boat attached to the bigger shipwreck. What happened to ‘turn the lights off’ ..? Funny that you should mention Slovenia when their economy is on the brink and it is very likely that they will request a so called bailout . “Portugal has so many problems that you don’t need make up more, or choose just the most negative statistics, that better suit your analyzes”. Portugal reminds me of Spain about a year ago. So many people in complete denial. Don’t worry Federico, I’m not singling you out, I think the view you express is quite general in Portugal, which is one of the reasons I think the country’s problems will not be resolved. “It’s not true. You can see in the official trade statistics (it’s INE that calculates that and Eurostat that validates) that this year there was never a negative month. April has been the worse with a 2,9% rise on exports, in May it recovered to 8.4%. In April there has been a small negative number in the exports to the EU (-0.8%), i don’t know if that’s what the WTO is showing on the graph you posted here”. Well look, I use the WTO data (which are supplied by the Portuguese trade department) simply because they are the easiest dataset to follow on a cross country basis. Sometimes there are discrepancies between data reported to the WTO and national data because of timings of the releases and subsequent corrections. Actually, the biggest difference is due to the fact that the WTO numbers are measured in dollars (not Euros) and the Euro is down year on year. But what are we really talking about here? 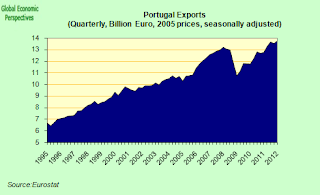 Are you denying that Portuguese export growth is slowing along with the rest of the word? In which case, as Krugman once asked, to which planet are you exporting? The issue is not whether one month’s data give a slight negative or slight positive reading on an interannual basis depending whether you measure in euros or dollars. The point I am trying to make is that my impression is you don’t understand by just how much exports need to grow to get sustainable growth now domestic demand is dead as a driver (remember, paying down all that debt) while moving towards a fiscal surplus to pay down the government debt is only another negative drag. And if you think I am biased, read the IMF report which I link to, and in particular the section on competitiveness. 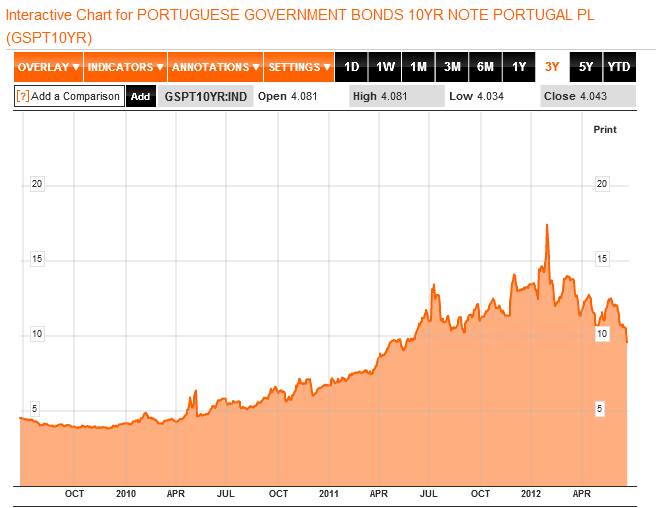 Portugal is complying with its objectives, but achieving them won’t be sufficient to avoid debt restructuring. I think it would help if people in Portugal tried to understand what the issues are, rather than simply suggesting that people have a down on them. To some extent you can see this problem all along the periphery – or would you suggest that Greece was also “doing well” – as people in one country after another (Latvia, Estonia, Hungary, Romania, Bulgaria, Greece, Italy, Spain, Portugal) say they will make it through, it’s just the others who are a mess. Such national pride is commendable, but it won’t turn things round. The reason I focus on manufacturing (which I do for ALL countries, not just Portugal) is that the key to coming out of the depression Portugal has fallen into is growth in manufacturing employment. Our societies have sold themselves a fantasy – that the world’s manufacturing will be done in China, and we will live from construction and services. This construction part is now over, and building industries everywhere will be much smaller. It is possible to live another way, countries like Japan and Germany, or the Czech Republic and Hungary show this is the case. 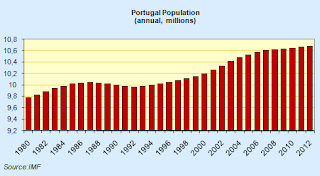 Naturally Portugal has a tourist industry, and an important surplus on this. Greece and Spain also run large, tourism dependent surpluses, but this isn’t the issue. It is manufacturing employment you need, and this involves buying less abroad, and making more at home. But as I say, if you can’t recognize this problem, you won’t solve it, which means the investor will say “better buy a Portuguese CDS than shares in a Portuguese company”, which is a pity. Incidentally, the key point is the Current Account deficit, which includes both goods and services. The IMF don’t see this being corrected this decade. “I agree with you that, generally speaking, national official forecasts are not the most reliable ones around. The only reason I mentioned the BoP’s (apart from the fact that they are not exactly upbeat, most of the time) it is because they seem to be a lot more recent than the ones you are referring and already take into account the unexpected small contraction of the first quarter (which Citi and the IMF could not know in the spring)”. The thing is, this better than expected first quarter is quite a general phenomenon (if you strip out Greece and Spain), even speaking globally. Many observers expected the US to fall into recession in the first quarter, and they didn’t, China had better than expected Q1 growth, etc. 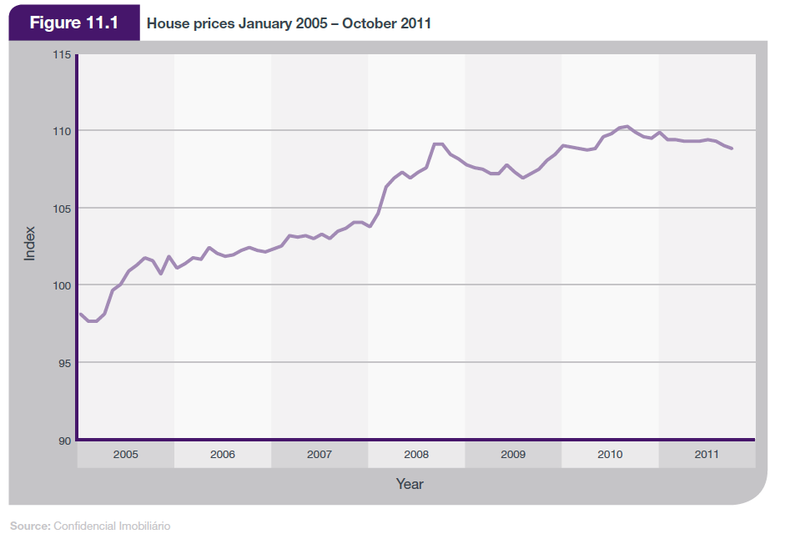 The phenomenon of unexpected stabilisation started last November and lasted through to February. The most likely explanation is that there was an improvement in risk sentiment (globally) following the ECB LTRO in November. Perhaps it seems strange to learn that manufacturing output in the Philippines could have been affected by an ECB decision to provide liquidity in European banks, but there we are, that’s the globalised world we live in. Now it looks like the ECB move only bought time, and there are clear signs that conditions in the US and China have deteriorated further, in particular order books have been shrinking which affects output six months forward. No man is an island, and Portugal certainly isn’t. The thing is, people have been far too optimistic about the global financial crisis, sounding the all clear well before time. If a lot of pre-crisis growth was funded by unsustainable and reckless borrowing, then post crisis growth (on aggregate, across countries in the developed world) is bound to be less, and recessions are likely to be more frequent. This is the new world we live in, and unfortunately we are condemned to adapt to it. In addition, populations in most European countries are ageing rapidly, meaning a larger dependent population to maintain, which means less domestic consumption, more taxes, and less services beyond the essential ones. Again, the new world we live in. The world doesn’t stand or fall on whether Portugal’s recession hits 3.5% this year. I think it will, but it may not, it depends on whether the government introduce another round of cuts, or make a deal with the Troika to loosen deficit objectives. So far the government doesn’t look inclined to this move. 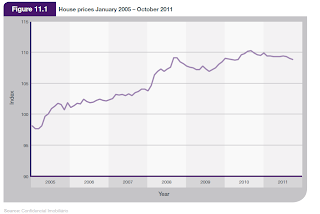 Biggest short term risks, rising unemployment and the implosion in construction activity. “All in all a not so serious and very superficial analysis of the Portuguese situation”. Thanks, feedback is always appreciated. “Funny that you should mention Slovenia when their economy is on the brink and it is very likely that they will request a so called bailout” . Yeah, I wrote a piece on that about a week ago – and then there were six – don’t know if you saw it. Slovenia is an interesting case, since they were going well till they entered the Euro. Edward, i’m not in denial, i started my post with “Portugal has so many problems…”, i simply pointed some things of your text that really don’t seem right. And let me tell you that it is offensive to say that a country and its people that are suffering so much, and without any of the mess we see in Greece and Spain, are in denial. No one here is in denial, that’s why we are accepting (obviously not with a smile on our face) everything that is happening. First that error (ok it’s not yours, it’s WTO’s, or it’s simply the dollar conversion). But your text really drives the reader to believe that the recovery of exports is over, and even with the recovery of the world’s economy it wont matter that much (because of prices and lack of competitiveness). Well that’s where i don’t agree, and i didn’t simply put a “good number” of May. If you bothered to open the link of the official exports numbers, you’ll see that the average growth so far this year is 9% (April was indeed the worst month with only 2,9%). But what really give us some confidence is that, that relative small growth is due to the situation in Europe, because the average growth for the rest of the world is 28,5%, and doesn’t seem to be slowing down. It’s really hard for me to accept a analyzes so pessimist in the subject, because if Europe is stagnated at this point, and even so we have an 9% average of growth, things tend to get better in the next months and year, not worse. That 28,5% average growth to the rest of the world shows that maybe the problem was not simply the price (even if a weaker Euro is helping at this point), but also companies very focused on internal market and after that only on EU, forgetting the rest of the world, and also a lack of economical diplomacy (that really suffered a revolution with this new government). But you didn’t explain one thing. Why do you only care about the Goods trade balance? 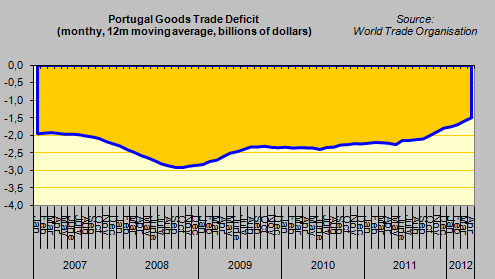 Portugal will end 2012 with a surplus in Goods + Services trade balance. Is that irrelevant? Why point that the Goods trade balance will be negative, forgetting the rest? What would be the UK without his services (not that i’m comparing 🙂 )? Do you really need to use this kind of arguments? “I suppose the demographic side would be one reason why perhaps Ireland’s situation is better off than Portugal etc”. Short run I’m not sure Ireland’s situation is any better than Portugal’s. They are – as one commenter pointed out – back in recession. They have a huge debt burden, and lack of international competitiveness – this is the issue all along the periphery, from Estonia to Ireland. What happens is that when you try to talk about this people get up and start shouting “no there isn’t a competitiveness problem”. I still even hear this from Greece. What people mean by this is that they don’t want low value manufacturing work, forgetting that all those people who worked in construction (or in the Portuguese case loss making state owned enterprises) lack the skills to start bio-tech companies. Many of the new jobs in Germany after the Harz labour law reforms were in low value assembly work. People may not like this, but it is better than remaining unemployed and your country eventually going bust. When I talk about denial, this is part of what I am getting at, I am thinking of denial that here on Europe’s periphery we need more low paid manufacturing jobs, to replace imports and to export to other (richer, ouch, that word hurts doesn’t it) parts of Europe. That is to say we need to live in the real world, not one we dream about. But on the other hand you are right. 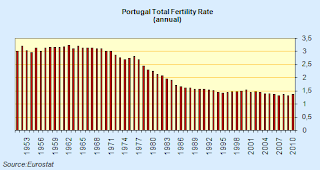 In the longer run Ireland is much more sustainable than Portugal, the demographics tell you that. Which is another issue people are in denial on, more rapid agers have higher contingent liabilities for the welfare system in a nearer future. What the hell do people think this debt crisis is all about at the end of the day! In addition the Euro Group just took a very important decision on bank recapitalisation which should mean that some of Ireland’s debt will be passed over to the Euro Group as a whole making the sovereign more sustainable. There is discrimination here, the Euro Group is discriminating in favour of those with private debt (Spain, Ireland, Slovenia) and against those with public debt (Greece, Italy). Portugal is in the middle, since it has large debt of both types. Maybe there will be another bank bailout on the back of the souring construction loans, and maybe Europe will help with this. But if you don’t identify the problems you can’t ask for help, and up to now the Bank of Portugal is claiming the banks are well capitalised. What exactly does this mean? Don’t you think this is the European disease, and the real reason the Euro probably won’t survive. We spend too much time attacking each other and not enough identifying and solving problems. Well you are comparing. What is the point, and what is your agenda? No, I am being unfair. But look, it isn’t hard to argue that the UK economy has been out of balance since the late 1980s and the financial sector deregulation. That the UK needs to recover some of those jobs lost in manufacturing in the meantime, and that the country is completely unbalanced between North and South, but WE AREN’T TALKING ABOUT THE UK (or Greece, or Spain), we are talking about Portugal, and I am trying to explain to you why, in my opinion, the manufacturing sector is too small, and that you need some sort of internal devaluation , apart from the fact that you are never going to be able to pay down all your debt, whether internal or external, because the population leaving/population ageing effect will mean you won’t be able to turn around your growth trend (see the chart) sufficiently. Yes, as it happens, I do. Because its called track record. Nothing Portugal has done since the mid 1990s has reversed the slump in trend growth. Why should we believe it is going to be possible now, when the country rejected the IMF advice and didn’t go for any kind of devaluation, whether “fiscal” or “internal”. Honestly, I suggest you read the report. I don’t doubt your sincerity, or concern for your country. “But what really give us some confidence is that, that relative small growth is due to the situation in Europe, because the average growth for the rest of the world is 28,5%, and doesn’t seem to be slowing down”. This is quite a technical problem, and to do with what we call “base effects”. 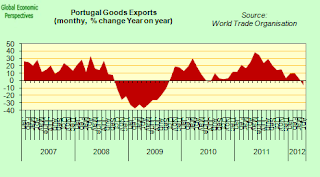 If you look at my chart for year on year Portuguese exports, you will see that the interannual rate of increase in May last year was around 38% and the rate in June 34%, well above the 9% average for the first months of this year you mention. This shows the rate of increase in Portuguese exports is slowing, and my argument is that we should expect it to continue to slow. But the reason it was so high last year is (in part) due to the base effect, since Portuguese exports fell to a very low level during the crisis, and hence very rapid rates of growth were possible from this low level. Something similar is now happening with ex-EU exports, which are growing fast. 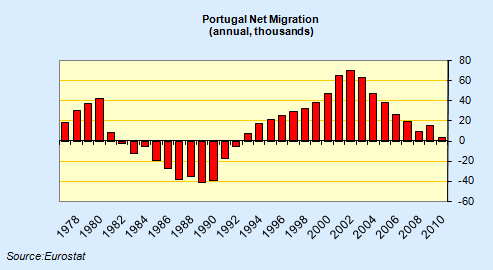 But previously they were a minority of Portuguese exports, which is why you get the rapid growth rates. These will slow, even if some Emerging Markets maintain a healthy rate of expansion in the second half of the year, but they will have to offset the FALL in exports to other parts of Europe. If you also take into account that during the quarter when Portuguese exports were growing at a monthly rate of 38% and 34% the Portuguese economy shrank by 0.2%. Now that exports are flat, and government cuts are much sharper, how much do you think it will shrink by? But does it really matter who is wrong and who is right about the intensity of this years contraction? The sustainability on debt dynamics on debt don’t change that much in the longer term if instead of a contraction of 3.5% the country’s economy only shrinks by 2%. The “mess” i was talking about was the riots in Athens and in some Spanish cities. 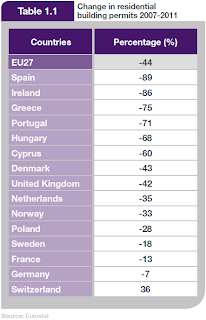 The Portuguese accepted much better the austerity than others. And this happened because clearly the country is not in denial (apart from communists and other small parts of the population). One year later the government party is still in front on the pools. I clearly don’t want my country without manufacturing, and obviously agree that the exports of goods are incredibly low comparing to what they could and should be. I was simply pointing that one can’t talk about trade balance and simply forget the service sector, specially in countries where that sector is so important (that’s why i mentioned the UK). Just look at today’s Eurostat “International trade in goods” and you’ll see 18 countries with deficit, it doesn’t mean that those 18 countries have the total trade balance negative. Of course it’s being done, simply not like the IMF wants. Companies are cutting in everything they can which includes wages and number of employees. I only objected to the use of “old” numbers when there were more recent ones. But it seems that the exact numbers don’t even matter that much… 😉 But hey, you are the economist, not me! Thanks v much. Myself I certainly would agree that Ireland has a competitiveness problem and needs “more low paid manufacturing jobs”. More low-paid services jobs too, for that matter. You know, I think this debate got lost somewhere. I wasn’t trying to make the point that May’s export numbers weren’t especially good, or that the Portuguese contraction wouldn’t be 3.4% rather than 3.5%. I was trying to make a somewhat larger point that the tragedy was Portuguese (and other periphery citizens) were making a large sacrifice for something which may “meet programme objectives”, but may not actually work in the sense of making for a long term stable society, with the sort of welfare services for the elderly we would all like to see. I am raising this because there is something wrong at the heart of the bailouts, which means money is being used in the wrong way – largely to sustain deficit reduction programmes which in many cases wouldn’t be needed if the economies could be got back to growth. If we were in a classic situation then the economies would simply devalue, and the money be spent helping to cover loan losses. But we are not in that situation and new ideas are needed. Obviously the Euro Area all comes out of this together, or it doesn’t come out at all. That means the Finns will have to pay in money, whether they like it or not. The thing that worries me most is that our discourse is still way too optimistic. 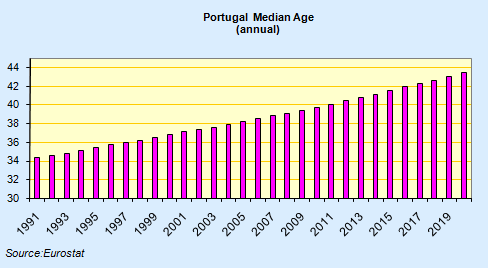 This all started in 2007 – well in Portugal’s case arguably it started in 1995, but let’s not be polemical. Now we are 5 years into the crisis, and rather than coming out there clear signs we are going deeper in. So I really don’t think one months exports, or one months Industrial output is either here or there in the big picture sense. We need to come to terms to what is happening to us, or we won’t ever put things straight and our societies will simply descend into decadence. Now Portugal’s programme won’t as it stands, generate sufficient momentum in growth to generate the much needed employment, which means that young people will keep leaving, having a negative feedback effect on the economy, which I think is the central point I was making. Portugal can’t come out of this alone, it needs European help, in the same way Spain needs help, or Greece needs help. We need a general policy change. This is what I am arguing. At the moment it is getting the wrong kind of help, loans to implement programmes that don’t produce adequate results. Incidentally Frederico, I live in Spain, and I can tell you there have been no serious riots of the kind which threaten social order here over the last few years. Spain’s population are watching and waiting. They aren’t happy, but they don’t know what to do. Increasingly they see the future only with apprehension and fear. What anger there is is mainly directed towards bank directors who they feel cheated them while earning large salaries. Maybe Portuguese have grasped the austerity more willingly than Spaniards have – Latvians and Estonians tell me the same – but you are only one year into this at this point. Give time to time. Now it is getting interesting, from my point of view (remember, I am no economist, so keep it simple please). So, we have a country that is broke and that, as far as the eye can see, has always needed to borrow money to keep going. At a certain moment, it was asked to pay extortionary interest rates for that money. What should it do? Portugal decided to borrow money on the terms set by the lenders and bank on convincing them that it was an honest country and deserved a break a little further down the road. As far as I can see, the only alternative path would be not to pay… and not to borrow! I can see the point of the stupidity of a lender that chokes the borrower and risks not getting its money back. But that is the lender’s choice, not the borrower’s, isn’t it? I mean, it is all very well to say “this doesn’t add up”. But what DOES add up? 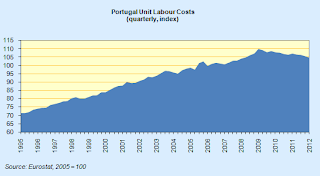 I suppose that is the reason that some economists that are against austerity end up saying “in the case of Portugal, there isn’t much they can do”. Even Krugman said “I hate to say this, but if I was the finance minister I wouldn’t do anything different” (I’m quoting from memory, and maybe he was just being diplomatic, as he was in Portugal at the time). I think the first thing is to concentrate less on the interest rate issue. I agree it is important, but in one country on the periphery after another politicians have focused on this in an exaggerated way, taking attention from the underlying question which is the sustainability of welfare services in low growth ageing societies. Paying high interest rates doesn’t help, but it isn’t the root of the problem. The issue isn’t how much money you all borrowed, it is how little growth you got from that money. The difference with Spain is instructive. Spain also got hopelessly in debt, but at least they had some “good times” to go with it. Now even the good times are gone. The thing is this is all my demographic argument is still highly debateable stuff, since it is very much an out of consensus (if increasingly contemplated) hypothesis. Incidentally, if you look at this post you will see that, despite insinuations in some comments, there is nothing especially anti Portuguese in my work, I am only trying to understand the “phenomena”, and I am a great admirer of Manoel de Oliveira and Fernando Pessoa. Not sure about that Krugman quote, since he has been pretty critical of the EU way of doing things. On the other hand, Portugal has no alternative but to negotiate the best deal it can get from the EU. 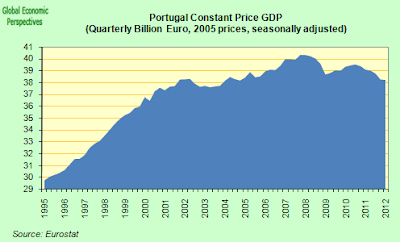 Now, as I am saying, I think there is no way forward for Portugal except as part of a general euro solution. The thing is, the euro is hanging by a thread at the moment, and could just as easily disintegrate as progress. Let’s just hope its the latter, because if not……. To progress the Euro Area has to become a federation of states like the USA. There really is no alternative. And this needs to happen comparatively quickly. The first steps are a banking and fiscal union. As I stressed, Portugal is claiming the banks are OK (I certainly hope the Bank of Portugal is better than the Bank of Spain when it says this…..), so you won’t get much relief from the banking union, unless it turns out that, yes, the banks are worse than we thought. Actually, with all that private debt, it is hard for me to accept they aren’t. But i haven’t studied Portuguese banks, and will remain silent on that count. So you need the fiscal union, and transfers to compensate health and pension systems for all those Portuguese who left and went to help build other parts of Europe. This was obvious to me in Latvia, it isn’t only the monetary union which implies the need for a fiscal one, but the unified labour market. Ask the grandparents in the “hollowed out” villages in Mexico. Well, the whole of Europe has a debt problem when we think about contingent liabilities in health and pension systems, so there are no easy answers, but if the ECB were to print money, and this money were to be used to subsidise employment generating projects (for example, paying employer social security contributions to make labour costs cheaper – a fiscal devaluation, but one paid for by the whole Euro Area, and by printing, not from taxes) then this would be a start. The key point is that it has to be a no brainer to see that having people working rather than being paid to stay at home has to be an economically more efficient way to use resources. Portuguese export jobs need to be seriously subsidised, and the country needs help paying down the debt. Well, these are no more than what people call “licks and promises” since I can hardly present a programme to get us out of the mess in a blog comment (though I have tried in numerous posts). It is also important to remember that there is no long term solution to the population issue. One day or another global population growth will stop, and the world’s population will start to decline at the same time as ageing. Negative GDP will become commonplace. All we can do is buy time, and try to find ways to achieve a soft landing, as well as learning to live with the situation. Which is why I find “denial” an unhelpful attitude, since as a biologist you will know, if you don’t identify a problem you are unlikely to find a solution for it. As Socrates said, knowing what we don’t know is the first step to knowledge. I think you will not disagree much with him. Basically, what is saying is that Portugal does not have much choice but plod along, but that more austerity would be a disaster, if the current measures don’t work. I never read much about the way the Swedes inverted their demographics tendency, although my Swedish friends mentioned various measures supporting family with multiple children (and I could see them with my own eyes in their prams). 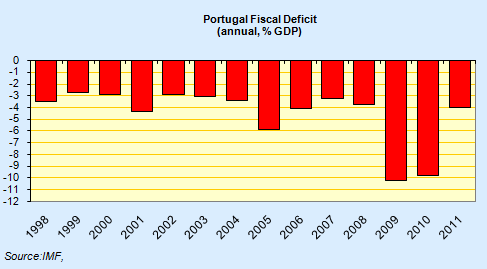 Unfortunately Portugal doesn’t seem to be tackling that problem at all, and this financial crisis will certainly not help. I would like to thank you for your analisys. I’m one of those that in the begining of the 2000s went abroad from Portugal into Northen europe. In this debate ( hopefully still alive, although nowadays the attention span of more than a day is becoming rare), the discussion of suggestions and ideas could be more constructive. 1. Investment in Education and research needs to continue. 4. The question of governance is complex to discuss just in a few lines, but more accountability and longer term incentives could help. I would like to mention that being proud of our nationality is something to praise, even being abroad, someone once said: going abroad you become an embassator of your country. These are just a few ideas, if you elaborated already some ideas in one of your blog posts, could you point me to one of them? I don’t want really to say I told you so, but I will. 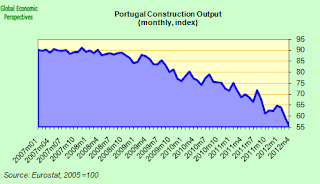 After this whole debate here that generated more heat than light, it turns out my intuitions were right, Portugal’s recession did accelerate in the second three months of the year, and guess what, earlier quarters were revised down worse than calculated trade performance (see stats office release out today). Not all economists get things right I know, but some of us do take care to try and follow data carefully, and thus are able reasonably reliably to pick up trends (not 100%, let’s say 80%). Inter-annual growth in June was down by 3.3%, which means the recession this year is going to be deeper than expected, as argued in this post. Quite honestly the country has to do something to revert the demographic decline, with doing this you will never stabilise public debt due to the pension and health liabilities pending. Short term this means immigration, long term it means getting fertility up. There is quite a lot on this whole aspect in the presentation I link to in the post. At present we have emigration, as the economy needs to create rather than destroy jobs. This means you need competitiveness electric shock treatment. That is to say labour and product markets reforms alone won’t work fast enough to save you at this point, as the ECB admitted in the Spanish case last week. So either Portugal needs to follow Iceland and do a limited default on some external debts and leave the euro and devalue (the IMF suggested at the weekend that there were lessons to be learnt from Iceland) which would be very hard, and which I am not advising, but which may well happen in the end. The other possibility would be the ECB print money (now I really do mean print, not the sort of half hearted measures we are seeing now) and help subsidise labour costs in the periphery countries (including Portugal) so that they can rapidly ease their way back into job creation. The difference between the sort of things you are suggesting, which would help, and what I am saying is macro, and what you are suggesting is micro. But unless macro tools are used to change the whole environment none of the micro ones can work effectively. This is the big mistake that is currently being made. Longer term, as Isabel sees, the only way is to raise fertility, and the only way to achieve this is to subsidise families who want to have children as some form of priority national investment – the very opposite of what is happening now. But this will mean some hard choices, since it will mean a transfer of resources from the old to the young, a transfer which I would argue is justified given that the countries survival is at stake.